← Who do You want to Be … when you grow up? In November 2005 I went to Assisi alone. It was a long awaited pilgrimage. I wanted to connect to the energy of the beloved Saint Francis of Assisi but I also knew, as with all pilgrimages, the very thing you think you are going for is not always the thing you discover where you are there. Here is a repeat of that story. Some stories are worth repeating. Driving towards Assisi in northern Italy, I noticed something red growing out of a bed of weeds. I grabbed my camera and clicked away. Some time later I scrolled through my camera and realised it was a rose. A double header. One that had already bloomed anda bud with the potential to boom. 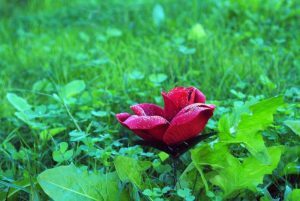 The rose is one of those plants that no matter how many weeds are about the place it will always bloom. Did you know the colour Rose is the colour of Unconditional Love? The Channel and well known Teacher Helen Barton, created even a page on her website where people can send pink bubbles to anyone that who might be unwell or needing love. As I looked at the image I took I was reminded of someone very important to me.. Her name was Rosa, Rosa Parks. Recently she died and thousands gathered to farewell this 92 year old civil rights matriarch. A quiet unassuming, modest woman with great courage who lived in Montgomery, Alabama in 1955 and who, one December evening, left work and boarded a bus for home. The bus became crowded, and Rosa, a black woman, was ordered to give up her seat to a white passenger. She chose to remain seated and that silent, simple decision eventually led to the disintegration of institutionalised segregation in the South, ushering in a new era of the civil rights movement. Just one individual can change the world, even without uttering one word. It is not the grand and showy actions that necessarily change us and our world. Indeed our very purpose for living could be brought down to one small act like the refusal to stand up at the right time and the courage to know when that right time may be. And that leads me to this. I know the word ‘deservability’ is not in the Dictionary. I made it up. It is however, a word that fascinates me. Sound familiar? Deservabilty comes from our belief that we earn good points and bad points according to how, good, kind, thoughtful, intelligent, wise, appreciative, appropriate, funny, or clever we are. The list goes on of course. Deservabilty also comes from the belief that if we behave or act in a certain way we can in some way control the events in our lives. Although this is right to a degree it is never really in our control. Jean and Graham work for two different companies. Jean’s friends got together and gave Jean a holiday for her 50th birthday. Jean had been a loyal and devoted worker for 20 years. She has three children but rarely ever took a day off in all that time. Graham was a single dad and had also put in 20 years of loyal service. He did not receive a gift from his work colleagues on his 20th anniversary. Does one deserve a holiday more than the other? Of course not and yet, we tend to judge ourselves and others when something happens that we feel is deserved’ or not deserved. Nothing is deserved or un-deserved in life. To believe this is to be seduced into the illusion that what we see is the whole story. Rather than believing what we think we see how much more powerful to look for the significance. To believe in deservability denies the magic and spontaneity that is intrinsic in all of life. Out of chaos comes calm, out of conflict comes connection, out of illness comes healing, out of pain comes wisdom and out of fear comes Love. What happens, happens. The issue in life is not whether we deserve so called ‘good’ or ‘bad; things. We will always have ups and downs. The real issue is how we address them. What choices can we make that can turn a tragedy into a triumph and therefore create a shift in global consciousness for the highest good of all? What choice can we make now that inspires us to stand in our truth, the Truth of our Being, especially when we appear to be surrounded by a field of weeds.